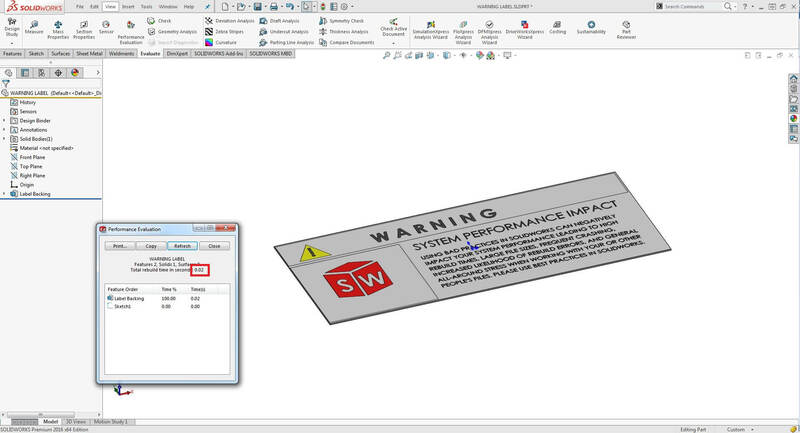 If you are designing something in SOLIDWORKS that has moving components, electrical or heat sources, or any other type of hazard, it’s a pretty good idea to apply a warning label to your design to warn users of the dangers they may face (lest you find yourself in court). Large Rebuild time reported: 64.65 seconds. Yikes! 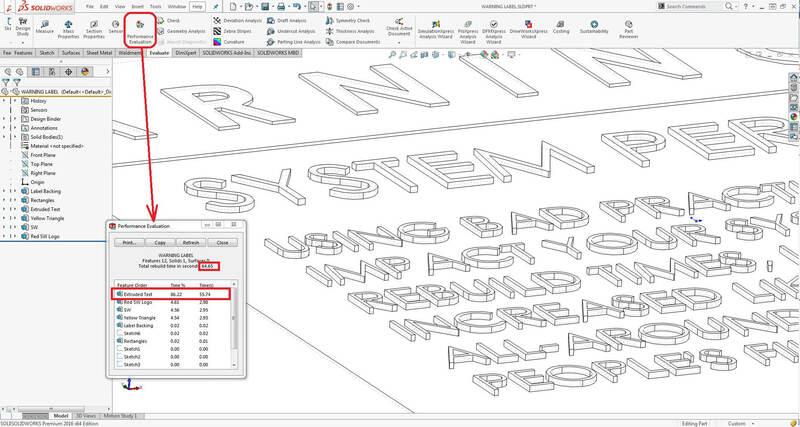 The total rebuild time is 64.65 seconds, with 86% (55.74 seconds) coming from just that one Extruded Text feature. This is due to the faces that are being unnecessarily created on the sides of each letter. One way I could potentially get around this would be to delete the Boss-Extrude and just use the Split Line command to split the faces. I’ve seen mixed results with this method. In this particular case, my rebuild time actually increased significantly to 408 seconds! This would also make it very tedious to change the colours whereas before I was able to change the colour of the various boss-extrudes, now I must click each letter. Drag and drop any decal of your choice onto the model where you want it to appear. You can optionally adjust the image mask if you wish to make parts of the decal transparent. That’s much better. With this method, the resulting label is nearly identical to look at, but the rebuild time is almost instantaneous. You’re probably wondering what the catch is? 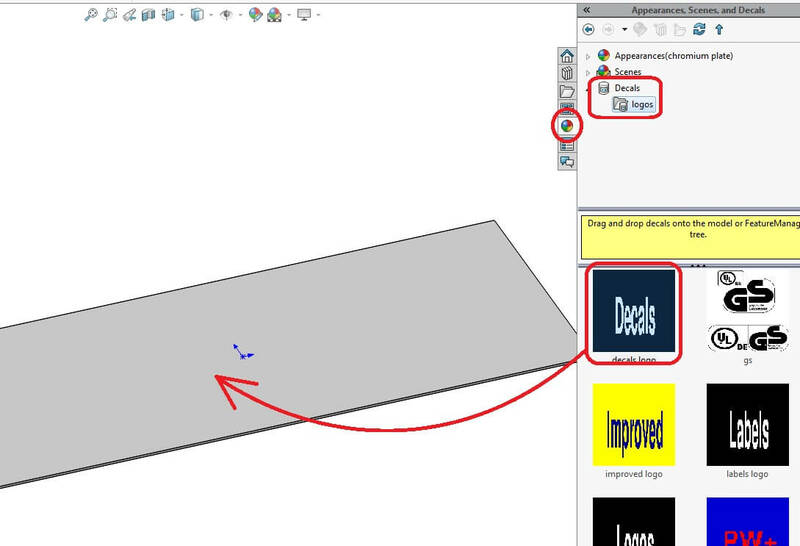 The only limitations for using SOLIDWORKS Decals are that you can’t change the text as easily, so make sure it is right the first time. The other limitation is that the decal will not be displayed unless you are in either Shaded or Shaded With Edges display modes. 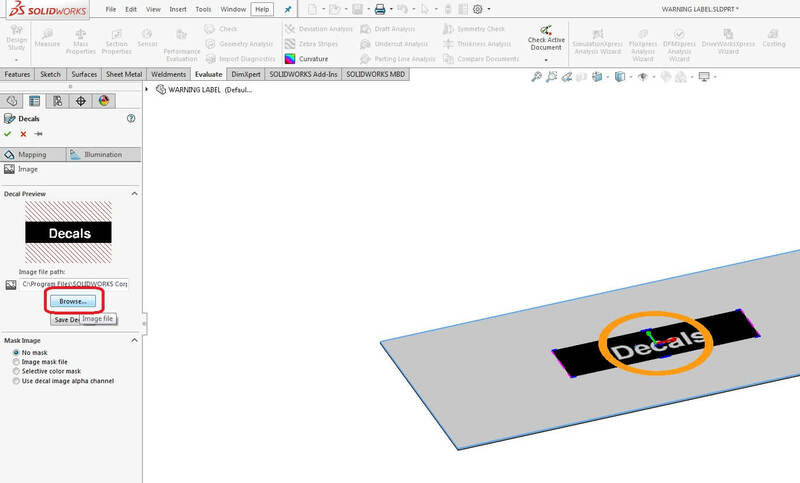 This could pose an issue if you are creating a 2D drawing for printing and have the drawings views in HLR, HLV, or Wireframe display modes. Of course, in a case such as this, you could potentially show the sketches from the deleted boss-extrudes. Jim has been using SolidWorks since 2001, and has spent most of that time working in the design of industrial automated manufacturing equipment. He has been working as an Applications Expert at Javelin Technologies in Oakville, Ontario since July 2012 and is a Certified SolidWorks Expert (CSWE).